The weather has been getting to me recently. 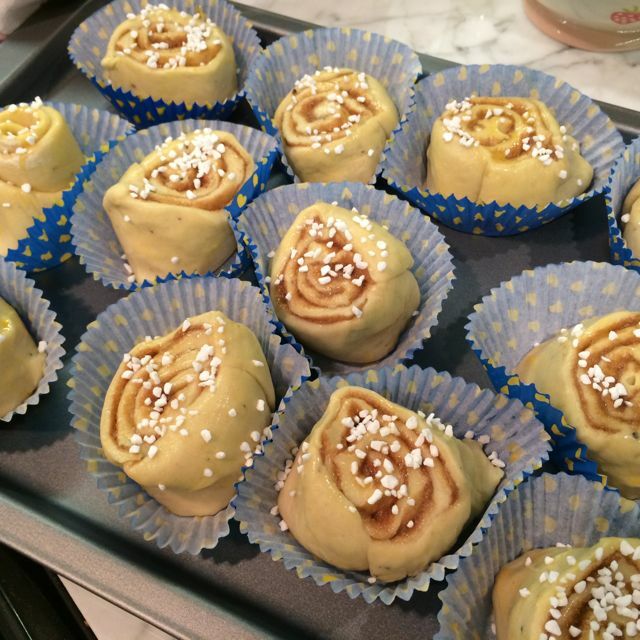 That, the uncertainty about my writing, and my yearning for the Nordic countries (it’s an on-going love affair)* have pushed me to extreme measures: the baking of Kanelbullar. 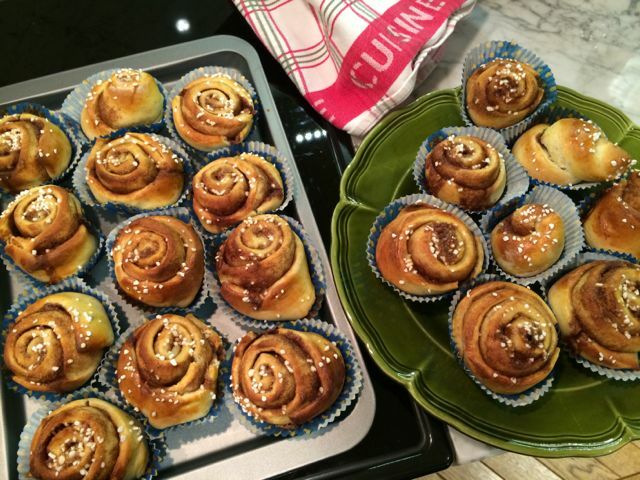 Kanelbullar are Swedish Cinnamon Buns. You will find them in every Swedish gas station, news kiosk, supermarket, and, of course, bakery. Melt the butter and add the milk. Warm up to about 37°C (think baby bath). Add the yeast and stir until it’s dissolved. 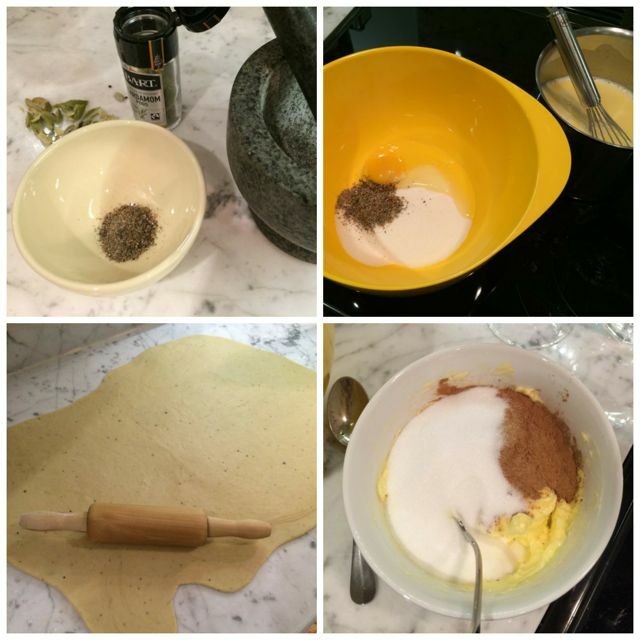 Then add the sugar, salt, cardamom, egg and enough flour to make a dough. You’ll need roughly 4/5 of the flour. Keep the rest for kneading. Work the dough about 10 minutes with a mixer or longer by hand until it has a shiny surface – add more flour if you have to. 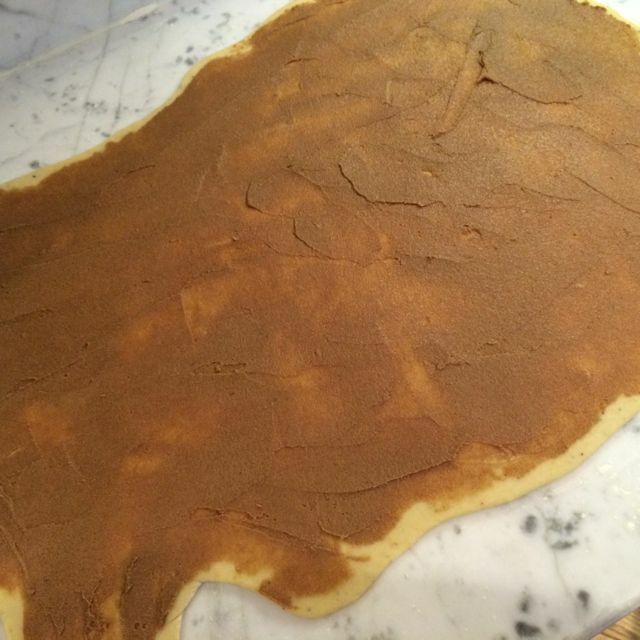 The dough should just stop sticking. Put dough into a bowl and cover with a clean tea towel. Leave to rise until it’s doubled in size. Work through with more flour until the dough can be shaped, then cut it in half and roll out each piece in a rectangular shape (circa 30x40cm). Combine butter, cinnamon and sugar and spread all of it evenly over both pieces. Roll each piece lengthways so you end up with a long, tight roll. Cut 3cm bites and place them on baking trays lined with baking paper – or put them in muffin cases (not too small, otherwise they can’t expand. Let the buns rest for another 30 minutes. Brush gently with beaten egg and sprinkle a bit of pearl sugar on each bun. Bake at 220°C for about 10 minutes. These buns freeze well. Let them cool down and freeze in freezer bags. To thaw, sprinkle the frozen buns with water and bake at 120°C for 10-15 minutes. *If you don’t know what I’m talking about, I suggest you watch Scandimania on Channel 4 od. Dear God, I want some of that dough right this second NOW. I have not watched Scandimania yet but it’s on the planner! love these, like the ones from the Nordic bakery on Golden Sqaure (where I used to live) and think the ones from Ikea are okay if there’s nothing else- would love to make my own, if I do will follow your recipe! And I completely know what you mean about the weather! Argh! When are you on holiday? meet up before? Its been a baking frenzy by the Huzz here recently. Snow days and no school or being able to drive to work have resulted in bread, cakes, doughnuts and bagels coming out the kitchen. I’m in the process of writing a blog post about the doughnuts – look out for more calories to enjoy! 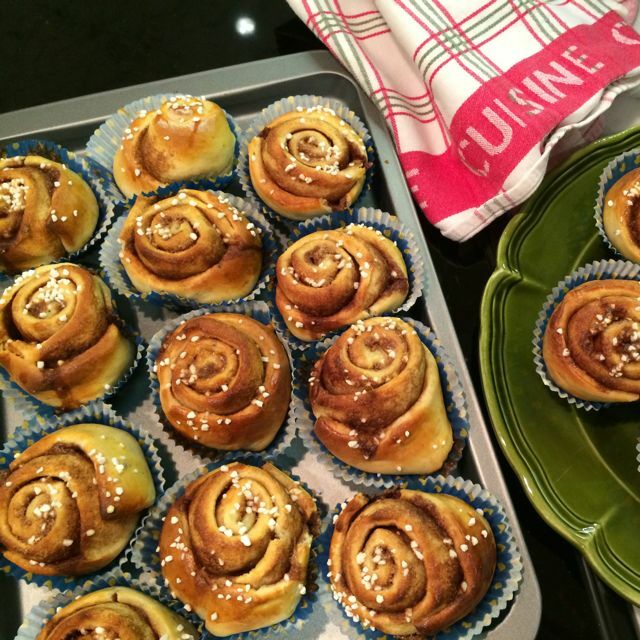 By law Swedish families are obliged to have sufficient number of buns for family and visitors in freezer at all times! So this only helps to bring us in line with current legislation. Those look delicious! Sometimes doing things like baking really take your mind off things!